When the tuition/discount calculation for a single student is too complex, or just doesn't 'fit', use a Student Fixed Fee to set the tuition amount to a fixed amount. When a student has a Fixed Fee and you use Post Tuition Fees (Transactions menu), this amount will be posted as a single tuition fee transaction regardless of the class tuition fees and regardless of any multi-student or multi-class discounts. 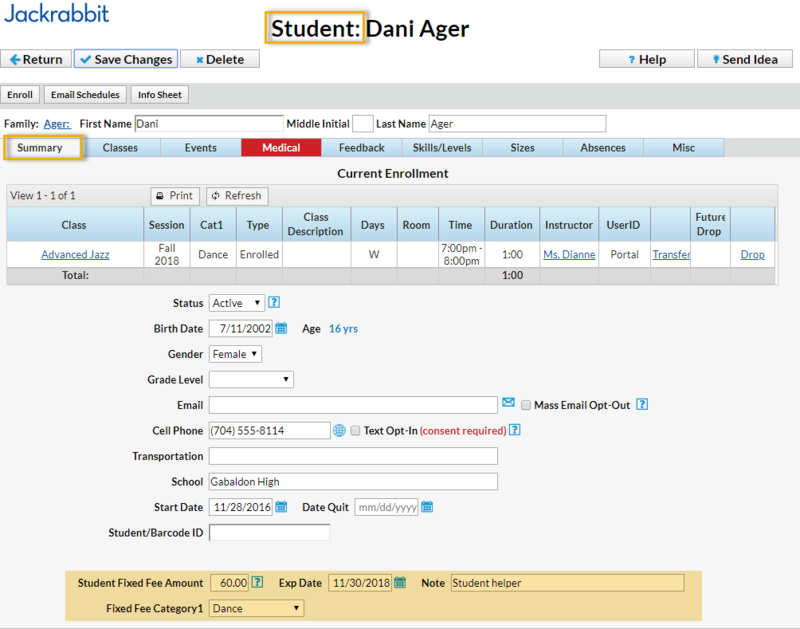 In the Student record, select the Summary tab. Enter an amount in the Student Fixed Fee field. Choose a Fixed Fee Category1. If you want to remove a Fixed Fee, clear all information in the Fixed Fee fields and save the changes. Entering a 0 or 0.00 will post a tuition fee of $0.00. 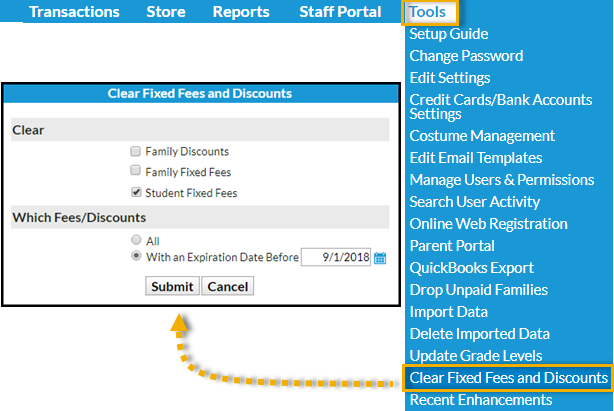 A Jackrabbit User with the User ID permission Clear Family User Defined Fields and Family/Student Fixed Fees and Discounts (in the Families category of permissions) can clear all Student Fixed Fees that are currently assigned to your students. This option is found in the Tools menu. If a Family Discount is saved on a family's Billing Info page, it will be applied to the Student Fixed Fee. The Additional Discount (at the bottom of Transactions > Post Tuition Fees) is applied to a Student Fixed Fee. A Fixed Fee may include tuition for classes that are in different Category 1s, however, you can only assign one Category 1 to the fee. Consider adding a Category 1 drop-down value specifically for Fixed Fee tuition revenue. Fixed Fees can be set to expire on a specified date. After an expiration date has passed, the Fixed Fee will be ignored when posting tuition fees. The Fixed Fee may need to be updated if the student adds/drops a class. You will be given the option to update the fee during the enroll/drop process. One student in a family can have a Fixed Fee while another does not. In this case, the Student Fixed Fee will post for one student and the regular tuition rates will post for the other when using Post Tuition Fees. If a family has a Family Fixed Fee and a student within the family has a Student Fixed Fee, both of the Fixed Fees will post when you use Transactions > Post Tuition Fees. Use Search from the Students menu to create a list of students who have Fixed Fees by setting Has Fixed Fee to Yes. Create a list of students who have a Fixed Fee that has expired by setting Has Fixed Fee to Expired.